sugar free | Naturopathy by Savvas Ioannides N.D.
Naturopathy by Savvas Ioannides N.D.
An excellent pre-work out snack that will give you lots of energy coming from good sources of carbohydrates, medium chain triglycerides and omega fatty acids. The delicious brownies also contain lots of healthy minerals that we need to replenish when we sweat at the gym. It also contains antioxidants to help heal those muscle fibres and increase your recovery rate. Place everything in the food processor and blend until combined. Remove from freezer and cut into desired shape. This recipe comes straight from yum. gluten free magazine March 2014 and it is created by Melissa Ambrosini. 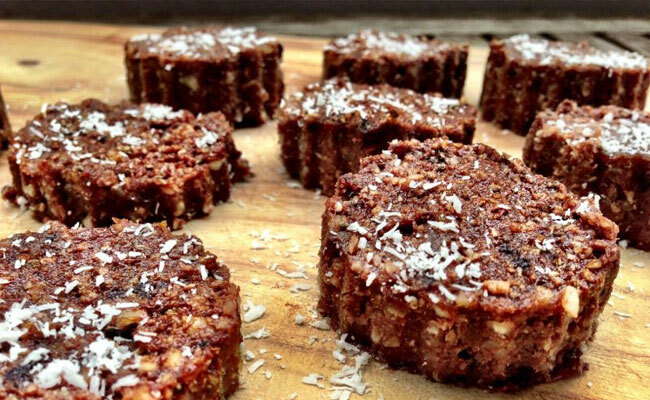 Another gluten/dairy/sugar/egg free recipe for times when you want to eat something sweet or when you want to supercharge your body with energy and hit the gym. As most of the times, I never really measure the ingredients but improvise on what’s available in my cupboard (that’s all the fun about it! ), however I will try to write down the measurements as accurately as possible. Put almonds in a high-speed blender such as Blendtec and press Pulse few times and then add all other ingredients and press pre-programmed button for Batters or Pulse all ingredients few times until preferred texture achieved. Add 2-3 tablespoons of coconut milk or other liquid at the end, only if needed to help the blender to mix. Roll them in coconut shreds into small balls. Refrigerate and serve.